So, we promised to take the kids to the dollar store that’s next to their swim school. Or rather, was next to their swim school. Now it’s a mattress and furniture liquidation place. 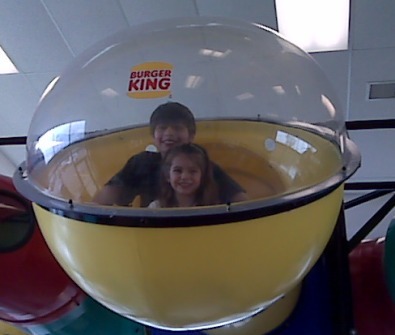 To make up for that, on Saturday, we went to stinky feet Burger King play place. Yeah. I know. The high life. Someone make it stop. Those who live in big plastic bubbles shouldn’t throw cheeseburgers. Shilling for Burger King unintentional. I bought Andrew a pair of new spring shoes since he totally blew out the original pair I bought. I. Mean. Totally. But he’s undecided. So, today I asked if they’re his or mine. Because, get this, we wear the same shoe size. I would totally wear those shoes. And, last, but hardly least, I think we may have spring here in Minnesota. Shhh. We don’t want to scare it away. TWRP would take it in a heartbeat… they’re actively seeking good YA. Yeah, enjoy BK while you can. Things change. Spring in Minnesota? Sure, I’ll be quiet, do nothing more than breathe warm breaths your way… hope it stays! Sounds like an intriguing combination on Speechless. M, thanks for the suggestion. I’m not sure it’s a WRP story. I’m not sure I’m a WRP writer, for that matter. And I don’t mean that in a bad way. This one is a little odd and it may end up being one of those stories only I like. Wouldn’t be the first time for that.